HOW TO CRACK WINDOWS PASSWORDS WITH OPHCRACK? Ophcrack is one of the Windows password cracker, whose working is based on rainbow tables (precomputed table for reversing cryptographic hash functions). Ophcrack is free and open source software which is available under GPL license. Ophcrack cracks LM hashes and NT hashes. It also cracks NTLM hashes, which is necessary when the password is longer than 14 characters. It runs on multiple platforms and has graphical user interface. Ophcrack is supported by Windows 2000, Windows XP, Windows Vista, Windows 7. Go to Ophcrack website and download "OphcrackLiveCD". Then burn the downloaded ISO file to a CD/DVD using any one image burning software. Change the boot settings of your computer to boot from a disc drive by entering into BIOS settings. Insert Ophcrack CD into the drive. Ophcrack initiates itself by displaying logo screen, then press enter button. In a window you can see all the user accounts available in that computer. From them select the required account for which the password is to be cracked. Then click launch or Crack button in the window. Process of cracking starts and if the Ophcrack gets your password then it is displayed in "NT pwd" column. That is the end of cracking process. You can use displayed password to login to the system. And if you need you can change it. HOW TO CREATE AND USE A PASSWORD RESET DISK? Password reset disk is one of the solution suggested by Windows itself to bypass password in windows systems. If you forget any user or administrator passwords of windows system then you can reset them by using "Password Reset Disk". But this "Password Reset Disk" must be created at the time of setting password or while you are already logged into your system. Once you forget your system password then you cannot create this "Password Reset Disk". Sign in with the user account for which you need to create password reset disk. Open "Control Panel" and go to "user accounts". Then connect a USB flash drive or Floppy disk to your system. In the left panel, Click on "Create a password reset disk". Click "next" in the wizard. Select the appropriate removable media which you have connected and click next. Type present password of that user account in text box and click "next". If your user account does not have password reset disk then it will create a password reset disk in that removable media. But if that user account already has an password reset disk created, it will ask you whether to replace old one. Select according to your wish. When this is finished, click "next". Now that removable media can be used as password reset disk. Make sure this disk is stored in safe place. 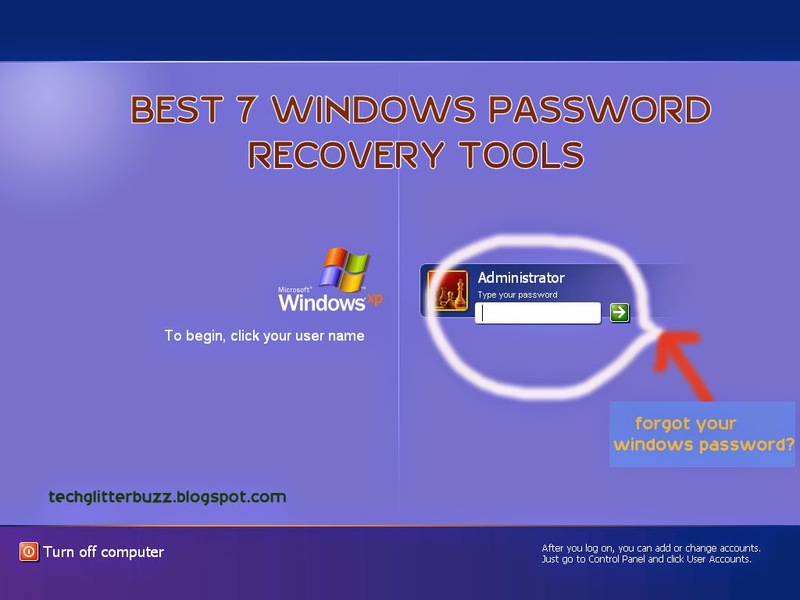 On the windows log on screen, Click the account to which you want to use the password reset disk. Click the reset password option below the password text field. 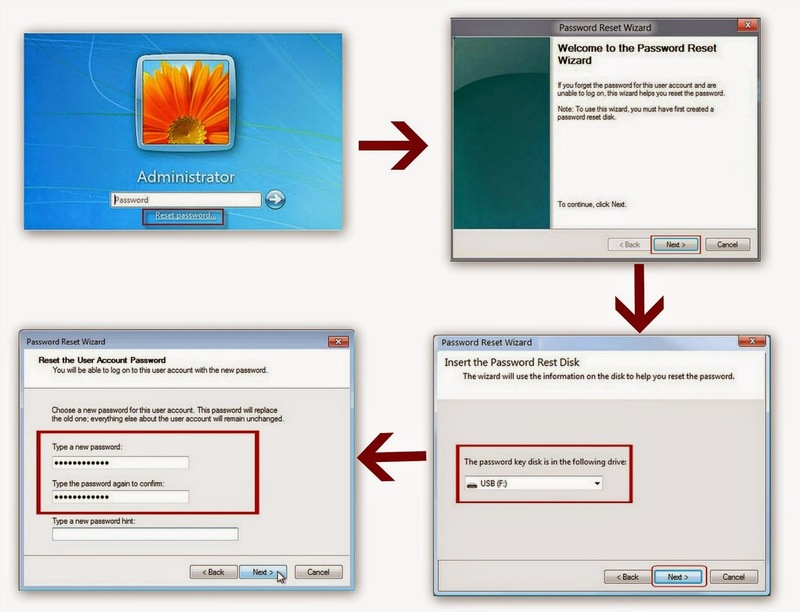 Then password reset wizard starts, which permits you to create a new password for that user account. Click "Next". Then insert "password reset disk" which is previously created for that account and click Next. Type new password for that user account in "new password text box". Again type same password in "new password text box" to conform password. Then password reset wizard quits and a new password is created for that user account. Then you are returned to windows log on screen. There you can type new password in order to log in to the user account. Password reset disk created for one account in one computer cannot be used for another account of any computer. This password reset disk is applicable for all the versions of Windows operating systems i.e., Windows XP, Windows 7, Windows 8. With the increased number of passwords whether they may be social media passwords or system user accounts passwords some people getting confused with them. Sometimes people fail to remember those passwords. At that time they cannot access their accounts. For social media accounts there is a chance of resetting password by providing some information like personal details. But in case of system user accounts it is somewhat difficult and complex. We can crack those passwords or we can by pass them by using some set of tricks and software's. If they are implemented correctly you can easily gain access to your system without any re-installation of operating system. I call these tricks or software's as by-pass tools, because they will by-pass the stage of password completely. Password reset disk is one of the solution suggested by Windows itself. If you forget any user or administrator passwords of windows system then you can reset them by using "Password Reset Disk". But this "Password Reset Disk" must be created at the time of setting password or while you are already logged into your system. Once you forget your system password then you cannot create this "Password Reset Disk". Also Read: HOW TO CREATE AND USE A PASSWORD RESET DISK? Ophcrack is one of the best free tool available for windows password cracking. It won't need any access to windows. All it need is a bootable DVD which consists of Ophcrack. It uses Brute-Force module for simple passwords. It recovers 99% alphanumeric passwords within seconds. Also Read: HOW TO CRACK WINDOWS PASSWORD WITH OPHCRACK? Instead of discovering and displaying your current password, PC login now deletes it and allows you to access windows without a password. After which you can create a new password for your user account. PC Login Now resets any type of password of any type of windows accounts with 100% success rate. Offline NT Password & Registry editor is similar to PC Login Now but it is complex to execute that PC login now because Offline NT Password is command line based. Don't feel bad that it is command based I will give you detailed steps on how to implement it correctly. It completely deletes the system password rather than recovering it. So I call is as one of the windows password reset tools. Kno-Boot is the fastest windows password recovery tool, which is similar to PC Login Now and Offline NT Password & Registry Editor. It is very simple and easy to use. It is one of the disc based recovery tool. It is only a temporary relief. Trinity rescue kit is one of the free windows password recover tool which works fast when compared to many other commercial recover tools. It is also a disk based recovery tool and it won't have any grahical representations in interface. It is completely command based but the positive thing is that most of the commands are only numbers. With the help of improved Winpass tool you can reset password. Cain & Able is one of the fastest and efficient windows password recovery tools available for free. Unlike other software's its working is different. 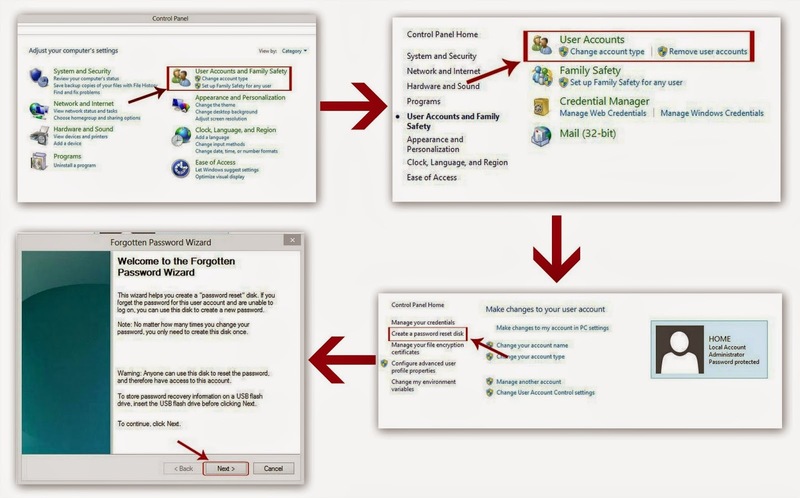 This software needs you to log in to your system by an administrator account and from there you must perform necessary steps to recover password. This software is suitable for only XP version only it is not compatible with Windows 7, 8 and Vista. If your PC has only one account then Cain & Able is not useful to recover and it is useless. It can recover passwords to the accounts other than with which you have logged in. Any way trying to crack your own password is also a illegitimate process. So please careful with passwords. In above tools "Password Reset Disk", can be efficient and easy to have executed. Please do perform these activities only if you have enough idea about them otherwise consult nearby expert. this is only for information purpose. If you know any other tools to recover windows passwords, please feel free to comment below. If you have any queries please comment below, I will answer those queries as soon as possible. HOW TO WATCH YOUTUBE VIDEOS OFFLINE? It is very good news for YouTube users in India. YouTube provides facility to watch videos even in offline mode. Yes, it is possible only in Android and i OS devices. Now you can download YouTube videos officially in Android and i OS devices by using the official YouTube App and later you can watch that videos offline whenever you want with out any network connection. YouTube provided this feature in order to help Indian YouTube users to minimize their data charges while streaming YouTube videos. This offline video feature of YouTube lets users to download videos and the downloaded videos are automatically saved under offline section option in the App menu. The videos downloaded in this method are stored as small .exo files. Those downloaded videos are available for next 48 hours only. After that time they will disappear in your offline section. The only thing you need to do, to get this feature is "update your YouTube App" and follow below procedure to download a video to offline section in the App. Touch on "Add to offline, " icon below the video or select "Add to offline" from video's context menu. Then a new pop-up window will be displayed with list of various resolutions in which that video is available. From them select the required resolution of video you wanted to download. Then video starts downloading to offline section. When once the downloading is completed. You can see the "Available offline, " icon below video in the place of icon. That's all the respective video is available for you in offline mode. If your device loses connectivity while adding video to offline. Your progress will resume automatically once you connect to a network. Manage offline videos means remove a video or playlist from offline. Select the Offline option in menu guide, to visit the offline. 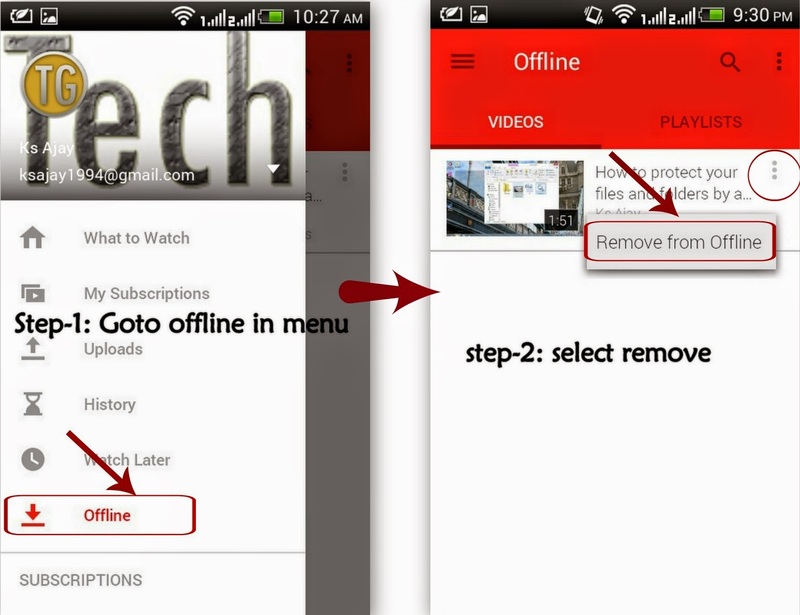 Then, select next to the video you would like to remove from offline. You can remove all offline videos, by touching on the right side top corner of screen in offline. Then select "Clear Offline".
" In a country like India, the future of the Internet is mobile. 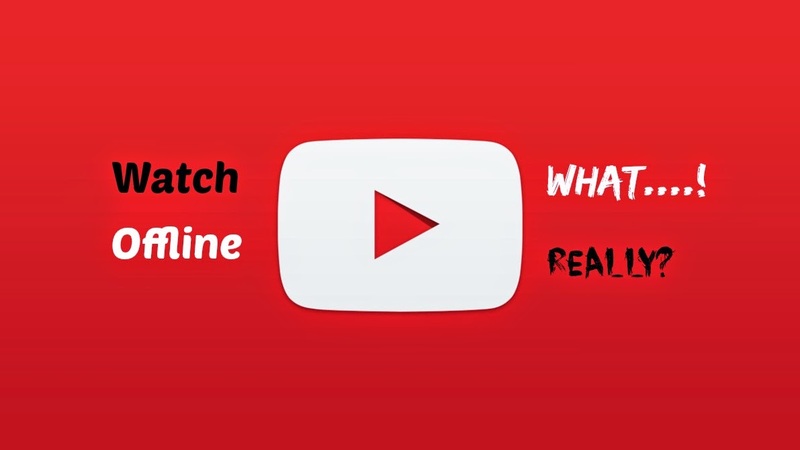 By launching this offline experience on YouTube in India today, we hope to help people move past the challenges of data connection, speed and cost to enjoy a smooth, buffer-free version of YouTube. " But this offline option is not provided for music albums and movies. You can not comment and like the offline videos. Any way there is no restrictions on "how many videos can be saved in offline?". You can save any number of videos in offline mode. HOW TO EDIT PDF's IN MS WORD? Portable Document Format (PDF) is a common format used for sharing documents. PDF is basically an image file, So that it requires sophisticated Optical Character Recognition (OCR) technology in order to convert that image format of PDF file to text. It would require Adobe Acrobat X Pro to edit the information in PDF file which is a costly one. But Word 2013 has made the things easy and cheap. Word 2013 has many worm features and among those features "Capability to edit PDF file" is an important feature among those features. Word 2013 lets us to edit PDF files by allowing us to open PDF file as .docx file, make changes to it and then save it back to PDF format. This conversion of PDF to text documents works best with textual PDF documents only. Open MS Word 2013, Click File > Open. Choose the location of the PDF file, which you wanted to edit and click Browse. Click on it and the click Open. After the PDF file is opened in text format, then make whatever changes you wanted to make to the PDF file. When once you are done with your Editing and changes, click File > Save as and then save the document as a PDF file. During the process of converting PDF file to editable .docx text format file, the page format and correspondence of the pages will be lost (Due to presence of PDF Reflow to convert PDF files into word documents in Word 2013). If you did not save the edited .docx file as PDF type, by default it will be saved as .docx file only. I think this is a handy tool to edit PDF files and convert them back to original PDF format. In Word 2007, we can save and export to PDF and XPS formats with the help of "SaveAsPDFandXps" add-in. Have you find any other tools to edit PDF files? If yes, comment below about those tools. Power data recovery is an all-in-one Data Recovery Software. This Mini-Tool Power data recovery can be used to recover damaged files and recover information from formatted hard disks, SATA, removable devices like CD's, DVD's, Blu-Ray disks, Memory cards and USB devices. Data recovery can be done on RAID devices and iPod by using Power data recovery. This Mini-Tool power data recovery is very efficient, powerful tool which is very easy to use and perform very speed recovery of data than any other tools available. By using Undelete recovery you can recover deleted files, folders and files deleted by using SHIFT+DELETE, which is not available in Recycle-bin or in your PC. This module in Power data recovery is specially designed for recovering lost and deleted data from CDs and DVDs. CDs and DVDs may be of any type and may be in any condition, data can be recovered by using power data recovery. 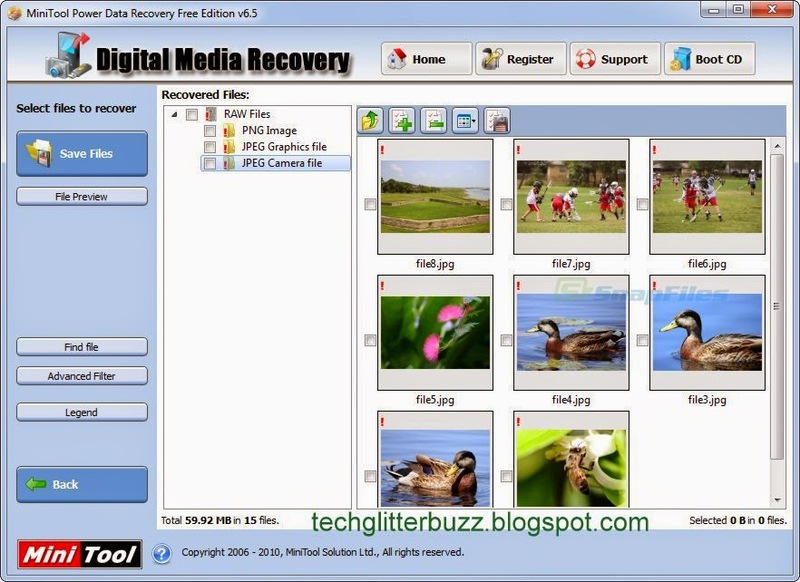 This module is used to recover data, if you find any of your PC partition is lost or deleted . This loss of partition happens when reinstalling Operating system by user or manually deleting it. At this time you can recover your data from lost partition. This module can be used to recover only if you don't find the partition in your hard disk. This is most powerful module that is available in Mini-Tool power data recovery to recover data. But this module can be used to recover data only if the partition is exist and that partition is damaged, which results in data loss. 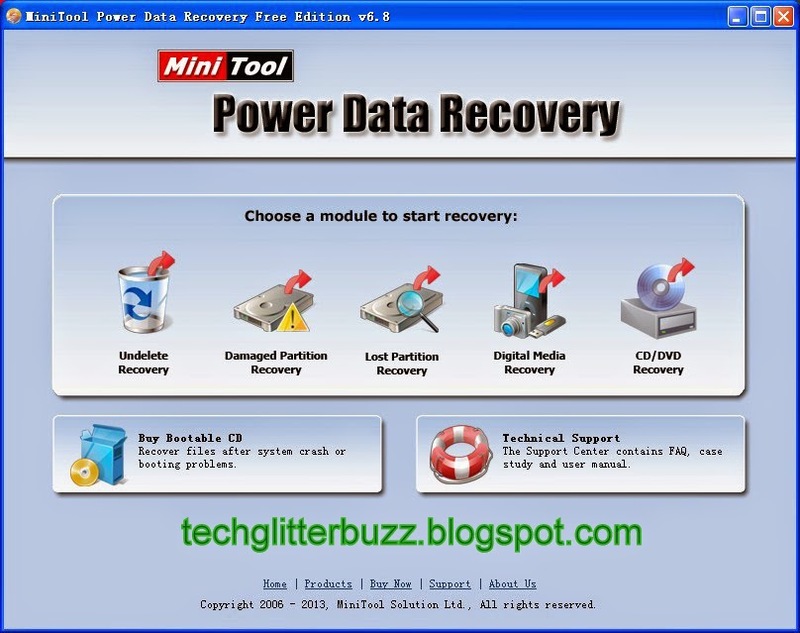 File name : Mini-Tool power data recovery. File Type : Zip file. File size : 5.6 MB.